It's a double hit from Running With Ponies (they taught us about the Assassin bug recently) as they investigate the very odd situation where an animal eats another animal's tongue, with a view to replacing that tongue and live inside the animal's whose tongue it just ate. "The rare Tongue-eating louse (Cymothoa exigua) has been found inside a weaverfish by fishermen off the coast of the Minquiers, a small group of islands under the jurisdiction of Jersey. 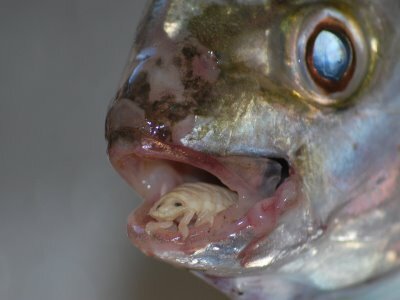 Although called a louse, it is actually a 2cm-long parasitic isopod crustacean, and it survives by burrowing into a fish through its gills, attaching itself to the muscular base of the tongue, and sucking the blood from it until it eventually withers away to nothing. The isopod then behaves almost like a replacement tongue, causing no additional harm to the host fish as it feeds off the scraps of food that enter its mouth." I actually landed one of these louse once. I was fishing as a lad at the Port in Napier when I reeled in a trevali. Whilst unhooking it I saw this pair of black eyes starring at me. I was like WTF? I used my dad's fishing knife to cut it out. And bugger me, it was a worm with legs, i'll never forget how it tried to crawl along.... my next move? I used it as bait!